Let’s face it. Who among us doesn’t get a little unnerved at the sight of flashing lights signaling us to pull over? It can be nerve-wracking to have a policeman pull you over for a routine traffic stop. You go through your mental checklist as you pullover. Yes, you stopped at the stop sign. Yes, you have driving under the speed limit. As far as you know, you have done nothing wrong. So why so nervous? A police stop puts an officer in charge of your future for a time. That officer can write you a ticket or give you a warning. That officer can also arrest you. And that can scare anyone. With the exception of a warning, all of these actions have possible adverse consequences for you. A routine traffic ticket can mean a several hundred dollar fine, the accumulation of points on your driving record and increased auto insurance costs. These consequences can be difficult to deal with. Points add up. If you accumulate 10 or more points in a five-year period in Oklahoma, your driver’s license will be suspended. If you drive for a living, this could have severe consequences for you. There are times that you should let a ticket stand. When the consequences of the ticket are minimal, it may not be beneficial to you to fight it. But when the consequences start to increase, you may want to consider fighting a traffic ticket. And if you decide to fight, you want to increase the odds of winning. For that reason, it is best to have an experienced Okmulgee traffic tickets attorney on your side. If you are considering fighting a ticket, contact an Okmulgee traffic ticket attorney at (918) 756-9600 or toll-free (888) Wirth-Law for a free consultation at the Wirth Law Office – Okmulgee. Your attorney can let you know about the circumstances of your traffic ticket, and whether you have a case worth fighting. 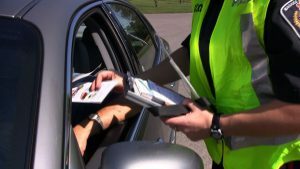 How Can an Okmulgee Traffic Tickets Attorney Help? Going to court is scary. And fighting any sort of charge requires your attendance at court. Having an attorney present and representing you allows you some additional peace of mind. In addition, your Okmulgee traffic tickets attorney knows the court, the judge, the prosecuting attorney, and quite possibly even the arresting officer. Your attorney knows how to present your case in the best possible persuasive light, so the judge is more likely to rule in your favor. Sometimes, you get lucky and the arresting officer fails to appear. When that happens, your case may be dismissed automatically. When the arresting officer appears, you need someone who knows the law on your side. A successful outcome may involve a plea bargain. And for that you need the help of your attorney. Your Okmulgee traffic tickets attorney is highly skilled and knows where to look for flaws in the prosecution’s case against you. Some flaws lie in the equipment used by police officers. Equipment can produce faulty results. Other flaws can be premised on overreaching prosecutors. Sometimes, the law itself may be faulty. Hiring an Okmulgee traffic tickets attorney puts the ball in your court again. And when the stakes are high, you need every advantage. Wirth Law Office offers free consultations to drivers considering whether they should fight a traffic ticket. If you’d like a confidential, no cost consultation with an Okmulgee traffic tickets attorney, call (918) 756-9600 or toll-free (888) Wirth-Law to talk to Wirth Law Office – Okmulgee. Or, enter your legal question or concern in the firm at the top right of this page, and one of our attorneys will email or call you.